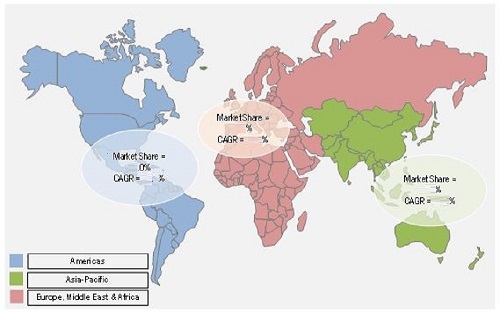 [102 Pages Report] The global 1,3-Propanediol market is estimated to register a CAGR of 10.4% between 2014 and 2021 and the market value is estimated to reach $621.2 million by 2021. The demand for 1,3-Propanediol is a feedstock utilized for manufacture of a number of chemicals and materials. The processes for manufacture of 1,3-Propanediol are chemical synthesis and fermentation. The most adopted process is the fermentation process. The market is relatively newer compared to a lot of other feedstock chemical markets. The demand for bio-based feedstock and the development of newer applications is driving the growth of the market. 1,3-Propanediol finds application in manufacturing of polytrimethylene terephthalate (PTT), polyurethane, cosmetics, personal care and cleaning products among others. The major application is PTT. It accounts for approximately 90.0% of the total market. 1,3-Propanediol is an essential ingredient for the manufacture of PTT. The commercial production of PTT has only been recently undertaken. The demand for PTT is gradually rising, boosting the demand for 1,3-PDO along with it. The growth of 1,3-Propanediol is also driven by the penetration into new application areas. The manufacturers of 1,3-Propanediol have been closely working with end-users for utilization of their product. The use of 1,3-Propanediol in applications such as cosmetics, personal care, cleaning and others segment is expected to register the highest growth. The others segment includes engine coolants, food and beverages, deicing fluids, heat transfer fluids, and unsaturated polyester resins. The manufacturing technology of 1,3-Propanediol is patent protected. This restricts the entry of newer players in the market. The market has only a few players. Any breakthrough in the development of new technology will allow new players to enter the market. The key player in the market is DuPont Tate & Lyle Bio Products Company, LLC. It is the market leader and captures the majority of the 1,3-Propanediol market. This report essentially aims to estimate the global market of 1,3-Propanediol for 2014 and to project the demand of the same by 2021. This market research study provides a detailed qualitative and quantitative analysis of the global 1,3-Propanediol market. The research methodology of the report involved the utilization of various secondary sources such as encyclopedia, directories, and databases to identify and collect information useful for this extensive commercial study of the 1,3-Propanediol market. The primary sources included experts from related industries and suppliers who were interviewed to obtain and verify critical information as well as to assess the future prospects of the 1,3-Propanediol market. Competitive developments of top players in the 1,3-Propanediol market have been discussed in detail. The leading players of this industry are DuPont Tate & Lyle Bio Products Company, LLC (U.S.), Metabolic Explorer SA (France) Zhangjiagang Glory Biomaterial Co. Ltd (China) and Zouping Mingxing Chemical Co., Ltd (China), and others have been profiled with their recent developments and other strategic industry activities. The global 1,3-Propanediol (1,3-PDO) market is estimated as $281.2 million in 2013 and is projected to grow at a CAGR of 10.4% from 2014 to 2021. Americas dominates the market both in terms of production and consumption of 1,3-PDO. DuPont Tate & Lyle Bio Products Company, LLC is the largest manufacturer of 1,3-PDO and has its plant at Loudon, Tennessee in the U.S. with a production capacity of 63,500.0 tons. Europe, Middle East & Africa is expected to grow at a highest growth rate; this can be attributed to the increasing adoption of bio-based materials in the Europe. 1,3-PDO is used in manufacture of polytrimethylene terephthalate (PTT), polyurethane, cosmetic, personal care and cleaning products; and others (engine coolants, deicing fluid, heat transfer fluid, unsaturated polyester resins, and others). PTT production represents the largest application in terms of volume consumed in 2013. Over 90.0% of the PDO produced is used in the manufacture of PTT fibers. There is continuous growth of application portfolio in the PDO market. PDO also finds application in food and beverages, adhesives and sealants, paints and coatings etc. The 1,3-propanediol market which is currently dominated by DuPont Tate & Lyle and is expected to witness entry of new players in the near future. There are few Chinese companies that are currently producing 1,3-PDO in insignificantly small amounts. The Asia-Pacific region is attracting new manufacturers owing to its domestic demand and low raw material and labor costs. 8.2.1 Growth in the Americas is Driven By the Demand in the U.S.
10.3 SK Chemicals Co., Ltd.
10.4 Zhangjiagang Glory Biomaterial Co., Ltd.
10.5 Zouping Mingxing Chemical Co., Ltd.